It was a biting cold day and, eventhough it was March, the air temperature was in - double digits. Before the sun gets high Cold air lies heavy over the ground, and as the sun rises, it starts to warm the air. As the air is warmed , the mist from the ground rises and , as it shifts and moves - creates patterns and dazzling cloud formations. 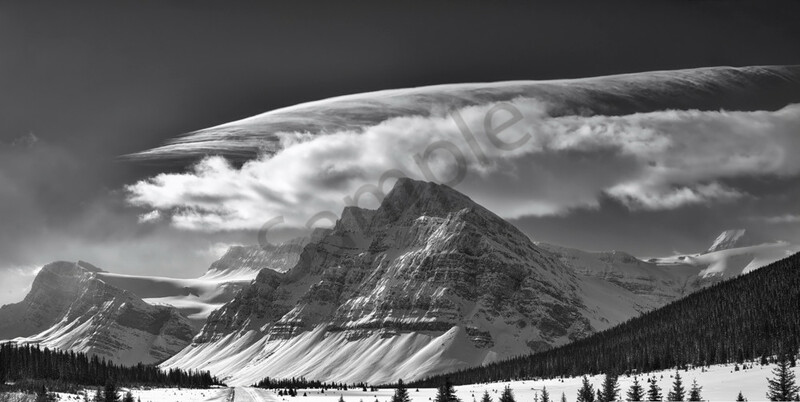 The winds aloft started to "spread" the clouds and they went from a bulbous puffy to a combination of that and wispy feather like shapes.In just moments the hovered above Crowfoot Mountain and Glacier, creating this stunning sight that lasted mere seconds!